The pace of advances in key clean energy technologies has been growing faster than many experts have predicted, to the point that solar and wind power, combined with systems for storing their output, can often be the least expensive options for new types of power-generating capacity. 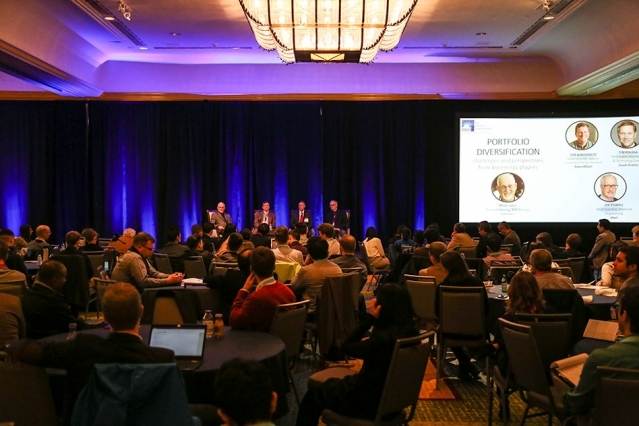 In fact, a radical transformation of the world’s energy landscape is well-underway, said several speakers at the annual MIT Energy Conference, held on March 2 and 3 in Kendall Square, in Cambridge, Massachusetts. In the opening keynote talk Tony Seba, co-founder of ReThink X and author of the book, “Clean Disruption of Energy and Transformation,” kicked off the event on an upbeat note that carried through many of the event’s keynote talks and panel discussions. He reflected on the increasingly rapid adoptions of transformative technologies over time, from cars replacing horses on the streets a century ago to the explosion of smartphones in the last decade. Seba listed several promising trends in low-emissions technologies for power production and storage, as well as in economic and regulatory models. For example, when a Colorado utility recently put out bids to replace the generating capacity of two large coal plants, they got bids for far more capacity than they needed — with the vast majority of prices for wind or solar power plus storage actually lower than those of coal power in the state. “It’s over, people!” Seba said. “Solar and wind power plus storage is already the cheapest by far.” As a result, he said, these greenhouse-gas-free options will inevitably take over the energy market, for purely economic reasons. Some other experts, including some of the conference’s other speakers, foresee a slower and more difficult path away from fossil fuels. But when truly disruptive new technologies come along, Seba said, “It’s usually the experts and the insiders and the mainstream analysts who dismiss it.” As an example, he showed how, year after year, the International Energy Agency’s projections of the future growth of installed solar capacity have lagged far behind the actual results. Now in its 13th year, the conference is run by the MIT Energy Club, a student-run organization that is the largest such club in the world, with about 5,000 members, MIT Energy Initiative Director Robert Armstrong said in his introduction to the conference. The world is facing two great interconnected challenges in energy, Armstrong said: the expected doubling of the global demand for energy through both population growth and rising incomes, and the need to drastically curb the greenhouse emissions associated with that energy. “It’s made doubly difficult by the fact that most of that energy demand growth is going to be in the developing world,” he said. That theme was echoed in the official launch at the conference of a new book from MIT Press, called “Taming the Sun,” by Varun Sivaram, a fellow at the Council on Foreign Relations and an adjunct professor at Georgetown University School of Foreign Service. In a keynote address, Sivaram described specific areas where innovations are needed in order to propel the next stages in harnessing solar energy’s potential. Those include new ways of financing such things as solar and battery installations, for example by bundling many projects into investment vehicles to spread out the risks of individual projects. The next hurdle to be overcome, Sivaram said, is “value deflation,” an ironic side effect of the rapid growth and plunging costs in the industry. As more solar capacity comes online at ever lower prices, the value of new installations and existing ones goes down, reflecting the lower revenue from a given amount of power delivered. Some advances that could help counter this effect, he said, would include efficiently converting solar energy to heat that could then be used throughout the night or converted back to electricity when needed, or harnessing the batteries in electric vehicles to help smooth the demand and supply curves of electricity. “These innovations would help preserve solar’s value by ensuring solar can be used no matter when it’s produced, or how it fluctuates,” he said. By pursuing these approaches, he said, “if we get this right, the 21st century will be one in which humanity finally secures cheap, clean, and virtually limitless energy” from the sun. Mark Jacobson, a professor of civil and environmental engineering at Stanford University, described his research suggesting that it’s possible for the U.S., and the world, to reduce fossil-fuel use almost entirely by midcentury, largely by converting most energy systems to electrical ones powered by hydro, offshore wind, and solar power with thermal storage, and using highly efficient heat pumps for all heating and cooling rather than less-efficient fuels, electric resistance heating, and conventional air conditioning. Jesse Jenkins, an MIT PhD student, in another keynote said that “electricity is the linchpin” of efforts to get to net-zero emissions. “It has the most options today, and can cut emissions the fastest of any sector.” That, in turn, would have a domino effect leading those using other energy systems to convert to electricity, he said. But Jenkins argued that getting to zero emissions is not necessarily the target to shoot for; in many situations a broader mix of zero-carbon and low-carbon baseload power sources may provide a more practical and economic path to emissions reduction.